Wamkelekile is a Xhosa word meaning 'we welcome you'. South Africans are renowned for their warm hospitality and happy disposition, so enjoy the welcome and The Wines. South African wines add joy to life! South African wines are grown in one of the world's most special places – with ancient soils, two oceans, soaring mountains and unparalleled natural beauty. The South African winelands are renowned for their breathtaking scenery and the wines are as full of variety as the myriad of cultures that form this Rainbow Nation. 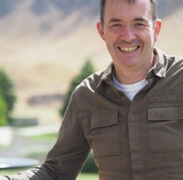 Jamie Goode is a London-based winewriter who is currently wine columnist with UK national newspaper The Sunday Express. As well as writing he also lectures and judges wine. Have you tried a fantastic South African red, white or rosé wine but don't know where to find it? South African wine industries pride themselves on sustainable wine production. The winelands of South Africa are some of the most breathtakingly beautiful in the world. Find South African wine events in your region.